In this article we will have a look on html basics. Reading this article you will learn to work with html languages and create websites. In 1980 a mark up language was developed to create documents that could be displayed on system of different hardware and operating system as well , the language was called Standard Generalized Markup Language SGML.HTML has evolved from SGML. Markup Language: Which refers to the tag that specifies the incorporation of text, graphics, sound and control of visual elements such as style and size of fonts and spaces between paragraphs, etc. Page Content: Indicates the text information which has to be displayed on the page. Figure 1: Representing the Structure of HTML Scripts. Web documents written in HTML are saved with suffix ‘.htm’ or ‘.html’. These documents can be displayed using any Web browser. <base> tag :creates a base “url” for all links on the page. <style> :includes CSS rules inside the document. <meta> tag: includes information about the Webpage like keywords and descriptions, particularly helpful for search applications. Listing 1: Representing the example of head tag. This element is a child of the <head> element. A specific title can be given to every page by writing the title in between opening and closing title tag.Using this element Title is displayed at the top of a browser window. Listing 2: Representing the example of title tag. This element appears just after the closing head tag (</head>) and comprises those parts of the Web page that has to be displayed in the main browser window it can be information, facts and figures. A <body> element may contain a set of paragraphs to complicated layouts containing forms, charts and tables. Listing 3: Representing the example of body tag. Listing 4: Representing the example of HTM document. HTML allows user to specify metadata - information about a document -in numerous way. The META element is used to include name/value pairs which describes the properties of the HTML document, like Expiry Date, key words, author of the documents etc. The <meta> tag is an empty element it has not any closing tag but carries information within attributes, so the forward slash character is required at the end of the element. Name Name for the property. Scheme Specifies a scheme ,use to interpret the property's value (as declared in the content attribute). http-equiv Used for http response message headers. keywords can be specified ,which will be used by the search engine to search a web page. Using following tag important keywords can be specified related to the web page. Listing 5: Representing the example of specifying keywords in meta tag. This is important information and many search engine use this information while searching a web page. So it can used to give an appropriate description of the page. Listing 6: Representing the example of document description in meta tag. It tells about time when the document was updated latest. Listing 7: Representing the example of document revision date in meta tag. Duration can be specified after which web page will keep refreshing itself. Web page keeps refreshing after every 15 seconds using following syntax. Listing 8: Representing the example of document refreshing in meta tag. Page redirection can be specified using Meta Tag. Here is an example of redirecting current page to another page. Duration is also specified after which page will be redirected. Listing 9: Representing the example of Page redirection in meta tag. If duration is not specified, the page will be redirected immediately. Listing 10: Representing the example of setting cookies in meta tag. If expiry date and time is not included, the cookie is considered a session cookie and will be deleted when the user close the browser. Listing 11: Representing the example of setting author name in meta tag. The name is the property, which designer want to set in the page. For example, the <font> element in the example carries an attribute face, which indicates the typeface of the text. The value of the attribute should be written in double quotation marks, and separated from the name by the equals sign. Listing 12: Representing the attribute. If an element carries an id attribute as unique identifier it is easy to identify that particular element and its content. If there are two elements having same name within a Web page (or style sheet), the id attribute may be used to distinguish between elements of the same name. Listing 13: Representing the id attribute. Remain unique in that document; no two attributes may have the same value in one HTML document. Now put cursor over "Titled Heading Tag Example" and see the tooltip. The class attribute is used to associate an element with style sheet, and specifies the class of element. The style attribute facilitate designer to mention CSS rules within the element. Any information which is there on the web page should be expressed in an impressive way. To make the web page interesting it is necessary that all information is written in decent manner for which text formatting is required. Here few basic text formatting elements like heading elements and paragraph elements are discussed. Any document starts with a heading. 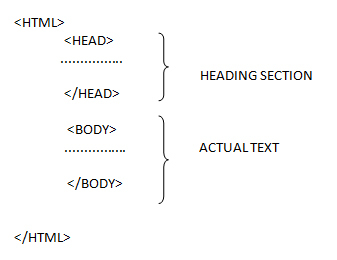 HTML allows designer to create six levels of headings (different sizes of heading), which can be implemented using elements <h1>, <h2>, <h3>, <h4>, <h5> and <h6>. While displaying each heading, Web browser adds one line above and below that heading. The <p> element helps user to give a structure to the text. Each paragraph should be placed in between an opening <p>and closing </p>tag. Here is a paragraph of text. The align attribute: this element is used for required alignment of paragraphs of text. Anything following the <br /> element starts on the next line. <br /> tag is an empty element, where opening and closing tags are not required. You are in HTML world. HTML allows a browser to hyphenate long words to justify a paragraph in better way.In some cases where a client browser is required to hyphenate a word , use the soft hyphen entity (­) to specify where a word need be hyphenated. Example for soft hyphen - The morbid fear of the number 13, or tri­skai­deka­phobia, has plagued some important historic figures like Mahamiya and Nanao. NOTE: This may not work with a few web browsers. Preserve Formatting - The <pre> Element: This element is used when any text has to be formatted in exactly the same way by which it was previously formatted. Every text between the opening <pre> tag and closing </pre> tag will preserve the formatting of the source document. Horizontal rules are used to visually divide sections of a webpage. The <hr> tag creates a line from the current position, within the document, to the right margin and breaks up the line accordingly. Again <hr /> tag is an example of an empty element, where opening and closing tags are note required. Note: The <hr /> element has also space between the characters ‘hr’ and the forward slash(/).If designer omit this space, some browsers will trouble rendering the line break, on the other hand if the forward slash is missed then it is not valid XHTML. These tags are helpful to make the text more presentable and impressive. This is an example of bold or bold strong typeface. Anything that appears in between <i>...</i> element is displayed italicised within the text. This is an example of italicized typeface. Anything that appears in between <u>...</u> element is displayed italicised within the text. This is an example of underlined typeface. Anything that appears in between a <strike>...</strike> element is displayed with strikethrough, a thin line through out that text. This is an example of strikethrough typeface. <tt> element is used to write the content which is desired to be in monospaced font. Most fonts are variable-width fonts as different letters are of different widths (for example, the letter w is wider than the letter i). In a monospaced font, however, each letter is the same width. This is an example of monospaced typeface. This element equips the user to write in superscript; the font size used is the same size as the characters surrounding it but is displayed half of a character’s height above the other characters. This is an example of superscript typeface. This element equips the user to write in subscript; the font size used is the same as the characters surrounding it, but is displayed half a character’s height beneath the other characters. This is an example of subscript typeface. The content appears in between <big> element is displayed one font size larger than the rest of the text surrounding it. This is an example of big typeface. The content appears in between <small> element is displayed one font size smaller than the rest of the text surrounding it. This is an example of small typeface. and elements allow user to group several elements and create sections or subsections of a page. Like, if user can put all the footnotes on a page within a <div> element to indicate that all of the elements within that <div> element are related to the footnotes. Style might attach to this <div> element so that they appear using a special set of style rules. Here in listing16 <div> element is used to group block-level elements together. The <span> element, on the other hand, is used to group inline element .If user wants a part of a sentence or paragraph to group together <span> element could be used for the purpose. These tags are commonly used with CSS to allow user to attach a style to a section of a page. This is all for today’s article, let me know if you have any question, see you next time. Nice and Clear code, But!!!! As your profile shows that you have "total 6+ years of experience in developing enterprise applications", so as a senior developer, you are posting such a low level, beginner article. THINK ABOUT IT!!! Thank you Mr. Khan for your appreciation, But!!!! are you trying to say that a person who has doctorate in English should forget that the ABCD.... is the basic literals of the English language or you are trying to establish that a Pilot should not ride the Bike ever or a senior developer who develops the enterprise applications, should forget about the basics of programming or pretend to be so. In my opinion as you learn and grow you can explain things in better way whatever be it is(Beginner or advance … ), rest is your thought. They said it truly "Your personality is the reflection of your thoughts". THINK ABOUT IT!!! See the reply to above comment.